Promises, promises, but are the premises valid? The Bangalore Political Action Committee (BPAC), has come out with a comparison of the manifestos of major parties in the state, specifically with reference to Bangalore city. The comparison in tabular format also comprises it own recommendation on the issues. The parties under consideration include the Janata Dal -Secular (JD-(S), Bharatiya Janata Party (BJP), Congress (INC), Karnataka Janata Party (KJP) and Loksatta party. The various points in the manifestos have been categorised under broad issues like ‘Governance’, ‘Infrastructure’, ‘Waste Management’, ‘Law & Order’, ‘Economy’, ‘Health & Housing’, ‘Education’ and ‘Miscellaneous’. For better governance, the JD(S) is proposing an all-powerful Metropolitan Planning Committee which will assimilate the powers of BDA, BMRDA and BIAPPA. The party also favors setting up of a State Urbanisation Committee and decentralisation of power to Urban Local Bodies (ULBs). The Congress promises an Act to bring all service providers under a single agency, which includes Water Supply and Sewage, Transport, Housing, Power and Developmental authorities. It will review the existing structure of BBMP and make it administratively viable. Moreover, the management of Gardens and Lakes will be made participatory, involving the Residents’ Associations, it says. The BJP on the other hand seeks enactment of the Bangalore Region Metropolitan Governance Bill. The party favors establishment of Metropolitan Planning Committees and Boards. More significantly, its plan to restructure the BBMP proposes a direct election of the Mayor, with a five-year term. A restructuring of the BDA and BWSSB is also proposed. On these governance issues, the BPAC is in favor of the Bangalore Region Metropolitan Governance Bill and also wants a full implementation of the BBMP Act and Karnataka Municipal Corporations Act. The JD(S), famous for its standoff over land acquisitions for the NICE corridor, if voted to power, wants to bring in transparency in property transactions with Property ID cards. It also mandates ‘Public consultation on all projects’, which despite being the rule today for major land acquisitions, is seen more as a farce committed on the affected populations. The BJP seeks to establish ‘Neighborhood Committees’, to increase community participation. However, how effective would such government-sponsored committees be, is a matter of speculation. The Loksatta party promises to ensure a functional Lokayukta. It too wants to setup a Metropolitan planning body to distinguish administration from policy. Some of the recommendations by the BPAC to increase transparency and regulation in governance include public disclosure of expenditure, tenders and progress of all projects, CAG audit of BBMP, a Public Accounts Committee within the BBMP, having citizen experts in Standing Committees of BBMP, nominating citizen experts as corporators, appointing Ward Committees and establishment of a Municipal cadre in the State. To resolve Infrastructure issues, the JD(S)wants to establish a Bangalore Arterial Roads Authority while the BJP seeks to decongest traffic by building flyovers, elevated roads, and subways. The Congress too favors elevated roads but also proposes a circular/commuter rail system. The party will pursue development of Greater Bengaluru by interconnecting tier-2 cities around Bengaluru. The JD(S) infrastructure focus for the city includes water harvesting, solar power, public toilets, cleaning of arterial storm water drains, sewage treatment plants, increased power generation, speeding up Metro rail work and extending it to new areas and maintenance of roads. The BJP promises to establish a Unified Transport Terminal at Majestic. The party also wants to create industrial towns within BBMP limits. There is also talk of ‘pedestrian friendly walkways’ in a city overrun by cars. Moreover, the party wants to do what it could not achieve in it first five years in government: complete all metro rail developmental work in next three years! The BJP manifesto promises four satellite towns near Bangalore to reduce congestion. An effective water system management, an expo center, a gas-based power plant near Bidadi, construction of toilets in all wards, women police stations in each zone, ‘mini-Lal Baghs’ around Bangalore and a ‘Heritage park’ are among other promises being made. The Congress manifesto focus on infrastructure includes improving Mass Rapid Transit System (MRTS) in every city and construction of multi-storied parking lots with private involvement. The party promises to make Karnataka investment-friendly and regain the confidence of industrialists. The Karnataka Janata Party (KJP), which is silent on governance issues, seems to have lot to say about infrastructure. And clearly their focus seems to be the new and upcoming landscape around the Bangalore International Airport. According to its manifesto, all development projects undertaken by Bangalore Development Authority (BDA) by creating new layouts will be completed within the time limit. Action is promised on rejuvenation of tanks, development of parks and entertainment centers. The KJP wants to build in collaboration with the Industrial Area Development Board an international convention center costing Rs. 150 crores, near Bangalore international airport. What will happen to the existing one on Tumkur road is not clear. More ambitious though, is the desire for establishing a ‘New Bangalore City’ for which it wants 10,000 acres to be identified. “Our party assures that works on construction of new Bangalore will be taken up as earlier as possible,” it promises. This clearly is an indication that real-estate opportunities in Bangalore are getting saturated, at least for the segments the party may be representing. The BPAC is recommending that proposals of Karnataka Information Technology & Communication Group be implemented. It wants technical members on the Boards of civic agencies and Technical advisory groups in each Board. 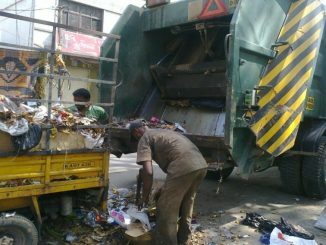 On waste management, a burning issue all over the city, the JD(S) is promising some solid measures to tackle the problem including establishment of a Bangalore Waste Management Authority, scientific incineration and recycling instead of dumping, five per cent ‘Environment Protection Tax’ on light plastic wrappings, tax exemption for cotton bags and mechanical sweeping of roads. The BJP promises to set up a Solid Waste Management Authority and use technology to minimise or recycle waste. The Congress manifesto promises effective waste management. It will implement all garbage clearance projects and recycle garbage to produce energy, manure and other products. The party promises to abolish outsourcing of Poura Karmika system and regularise the services of present Poura Karmikas gradually. On water management, the JD(S) just mentions recycling of used water. The BJP seeks to incentivize this activity by providing a discount on water bills for recycling water. It also want to setup a separate unit to supervise implementation of rainwater harvesting, which so far has been a big flop in the city like is garbage segregation. To tackle Law and Order, the JD(S) manifesto promises to increase the number of Public Prosecutors, appoint lady constables and SIs, create facilities for women to file complaints on arterial roads, start ‘door-to-door bus service’ by BMTC for women and open hostels for women in distress. The BJP wants to take the help of technology and install CCTVs in sensitive areas. The party wants to set up an Anti- Terrorist Squad to tackle terrorist incidents. The Congress manifesto promises streamlining of police departments. Probably in the light of accusations against the BJP government that innocents are being framed in terror cases, the Congress party promises to constitute a state-level committee under the chairmanship of a retired High Court Judge to look into the cases of detention implicating innocent persons in terrorism cases and establish fast track courts to try terrorism-related cases and heinous crimes against women and children. The party also proposes 20 per cent reservation for recruitment of women in the police department. Under Health and Housing, the JD(S) will set up a ‘Department of Health Services’ within the BBMP. How this will improve health is not sure, but certainly the cash-strapped BBMP’s economic health will move more into the red. Another move which will put pressure on the state finances would be the party’s promise of ‘Free distribution of drugs’. The manifesto also promises a new Healthcare Delivery System modelled on NHS and a Karnataka State Medical Assistance Fund. The BJP manifesto promises Yashaswini cards to all BPL Families. It wants to provide cashless hospital services to all citizens of the state and a more ambitious ‘Helicopter Ambulance’ Emergency services on the lines of the 108 ambulance service. Of course, the additional cost of providing helipads at every corner is not considered unless it is modelled like a search-and-rescue mission with health workers being parachuted into affected areas! The Congress manifesto promises that all PHCs/Taluka and District hospitals will be upgraded. It also has an ambitious plan to set up ‘high-tech super specialty’ hospitals in every Revenue division. On housing, the JD(S) manifesto talks of constructing 3.5 Lakh low cost houses and distribution of 35,000 sites annually. The BJP manifesto promises housing schemes for lower and middle income groups, compensation within three months when land is acquired for layout formation, a time bound program for site distribution in all cities and corporations by Town Development Authorities and regularizing houses and properties occupied for decades. The Congress promises houses for urban poor and middle-class and waiver of all loans under government housing schemes as a one-time measure. It promises to make Bangalore a slum-free city within five years by building apartments in areas with slums. The KJP will waive the interest and distribute possession certificates to the beneficiaries of the “my home my property” (Nanna mane, nanna swatthu) program. The party recognises that a large number of people are depending on rented houses in Bangalore city. “Our party desires to construct multi- storey apartment buildings to rent them to the needy”, it says. KJP also desires to formulate a massive housing program for workers of unorganised sector. The BPAC recommends that 50% of the stamp duties collected on property transactions in BBMP limits should be given to the city. On the Economy, the JD(S) manifesto promises a Tumkur-Bangalore-Hosur-Mysore-Mandya Industrial Corridor, uninterrupted power to industries, developed industrial land and sheds to be leased to industries, restoring of STPL Policy, a Karnataka Skill Improvement Commission, training of 3 million skilled workers and establishment of Peenya Industrial Township Authority. The BJP promises to organise job fairs in every district every month, setting up technology parks in all districts, investor-friendly environment for NRI investors, implementation of state industrial policy, and set up of industrial centers in major cities, all in a time bound manner. The Congress promises to develop an eight-lane road from Bidar to Chamrajnagar called the Karnataka Kalyana Patha, and construct appropriate industrial parks and townships along it to create 50 lakh jobs. The PWD will be revamped, providing more transparency, it says. It will also offer a Sales Tax and VAT concession to 2-wheeler and 3-wheeler electric vehicles within urban limits to curb pollution and provide Green mobility. On Education, the significant promises of JD(S) manifesto include revised norms for school admissions based on territorial jurisdiction, Kannada in PUC-II to be considered for calculating rank in CETs and 75 per cent salary grant to urban private schools using State Syllabus. It also promises to set up 87 new PU Colleges and 241 High Schools and strict implementation of RTE directives. Probably the JD(S) manifesto committee did not know that all the schools henceforth will shift to Central Syllabus slowly. As for BJP it promises that spending on education will be increased from 1 per cent of GDP to 3 per cent, effective Implementation of Right to Education Act, 2009, free supply of specially designed digital textbooks and learning aides for blind children in Braille Language, implementation of Dr C N R. Committee Recommendations and re-look at Karnataka Public Libraries Act, 1965. It also wants to bifurcate Medical Education into three categories: Para-medical, Forensic Support, Alternative Medicine Diploma. The Congress promises a reduction of income limit from Rs 3 lakhs to Rs 1.5 lakh under RTE admission criteria, restructuring of government schools, focus on Kannada as the language of teaching upto 7th standard, filling up teacher vacancies, starting women’s college in every district with hostel facilities and provide free laptops/notepads to all PUC students. The KJP wants to extend to all districts the ‘Sakshara Bharatha’ program to educate rural illiterate women belonging to SC/ST, minorities and Backward classes on priority basis, which is underway in 20 districts and benefiting 40 lakh women. The Loksatta party promises that any person who wants to learn a new skill will be provided job-related training, with industry support. Mentoring will start at high school level and rural girls and women will be provided free education for any level of education. It will also implement 30 per cent reservation of seats for women in colleges and universities and provide vocational training in government schools from 9th standard onwards. Some other significant promises in JD(S) manifesto include: enforcement of Vehicular Emission Standards, reduction in advertising boards across the city, planting of trees and maintenance of lakes and parks. The Congress manifesto also has many other promises with a section on Youth and Kannada Culture, which talks of constructing an auditorium in every district center, encouragement to minority languages like Pali, Prakrit, Konkani, Tulu, Kodava and Sanskrit, setting up an International Film Institute at Hesarghatta, skill development centers for youth and scholarships for sports persons. The Green Manifesto has been drafted by Bangalore Eco Team and Association of Green Industries and Services, and will be presented to all parties and contestants in the Karnataka Legislative Assembly Elections, 2018. Now that we have another BBMP council election, it may be worth asking why urban middle class does not turn up to vote?